What a great day. What a great 19 minutes. It’s a shame though we lost Rogers at Liverpool – he was doing great work for us by keeping them mired in mid-table. Now let’s hope that Chelsea Business Club retain Jose. Back to the game. Lets hope that every week the media go after AW if this is the reaction we get. To be fair the media is full of morons and retards. Their mid-week questions were moronic. Ospina was our goalie for most of last season and no-one seemed to complain then. This was nothing to do with Cech and more I think to do with the media trying to go after AW; this was their “wedge” issue. And AW, rightly, go pissed off with them. Oh, right. Back to the game. We just blew them away. 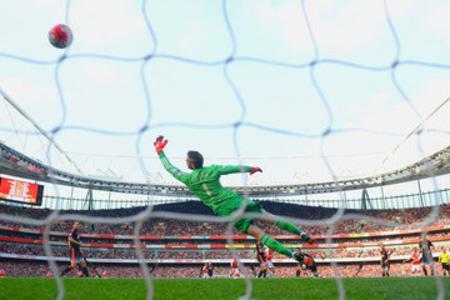 Of course the Alexis goals were excellent – that 2nd one was breath-taking – it was similar to his F A Cup Final goal. Ozil was outstanding; and he scored. But it was the overall speed of play. Such a contrast to earlier in the season. In fact the side-ways and slow approach of MU was much like how we had been playing prior to Leicester. Our play was so fast, incisive and direct that they could not just keep track of our movement. And who was at the center of it? Only our articulate, educated TW14. When did this boy actually discover a football brain? Remember all those comments from the pundits? Oh, and our loyal Arsenal fans? Today Theo provided dynamic movement on and off the ball. His movement for the 2nd goal and lay-off pass to Ozil was perfect; his one touch pass to Alexis lead to the 3rd goal. But more interesting than either of these two nuggets was the aggressive closing down of the MU defenders. I honestly don’t know when I’ve ever seen Theo (or any attacker aside from Alexis) make a slide tackle on the half way line to regain the ball. There was an urgency and energy that permeated his play the entire game. It was like he was the energizer Theo. All, of course, in sharp contrast to gormless Giroud. This is the most impressive performance I’ve seen from Theo. And his intelligent (yes, I used the word intelligent in relation to Theo – who would have though that was possible) movement opened up opportunities for the entire team. His timing of runs and their direction opened up the MU defense. Which, it had to be said, was pretty poor. Before the game I thought the game would be decided by the tactics of the respective managers with my sense that LVG would get it right. Except I was wrong. What the hell was he doing with Young at full-back? And why bring on the big-Afro at half-time to play him in midfield? The only negatives today was the two times Reverse Ramsey lost the ball on the edge of the penalty area by trying to be too fancy. This is a very dangerous habit that must be eliminated. When outside our penalty area he should not try to be so cute. Thankfully we had our world-calls (other) goalie in place. One save in the first half (after Reverse boy missed his open goal) really settled the game for us today. Going in at half time with a three goal lead meant we’d basically closed out the game. But here’s the other thing I loved about today. We did not try to play in the 2nd half. We parked the bus – we ceded the field to MU and just sat back. We did not go charging for the 4th goal (though Giroud should have scored that) nor chasing the game. We let MU have the ball but given how miserable they were they created quite little. There was a confidence and compactness in our defense. Both full-backs had control over their respective wingers; the BFG and BEB (Big Eared Brazilian) were rarely troubled. And our bouncing Cech dominated the box. Of course in front of the defense we had our massive Coq. He demonstrated to both Carrick and their ancient Nazi how to play the defense mid-field position. Super aggressive and very controlled. I like that even when he picks up a yellow card he can still manage his game and stay on the pitch without sacrificing his contribution. It’s also interesting that Cech had a few important saves to make but that De Gea barely made any saves – we either scored or just outright missed our chances (Ramsey, Giroud and Chamberlain). Their defense really was horrible.